In June 1994 myself, my wife Kay, our daughter Leslie and Kay’s mother Evelyn left for our first trip to Norway. Our trip was to be for 3 weeks for Kay and me and about half that much for the others. As on any trip, planning was essential. To break the ice we decided that a short tour of 3 days from Oslo to Bergen would let us get a better start. This was a good thing as it not only let us see more of the country side, but let us get into the “but we don’t speak Norwegian” mode. As it turned out, this was not a serious problem but there were times when I really wanted to speak in detail to some of my older cousins. Most of the younger Norwegians speak English. I should say at this point that my cousins on my father’s side were there and waiting to visit with us. The Norwegians were very easy to deal with and went out of their way to help. The only one that was not was a Highway Patrolman at a highway check-point and my cousin Helene took care of that. 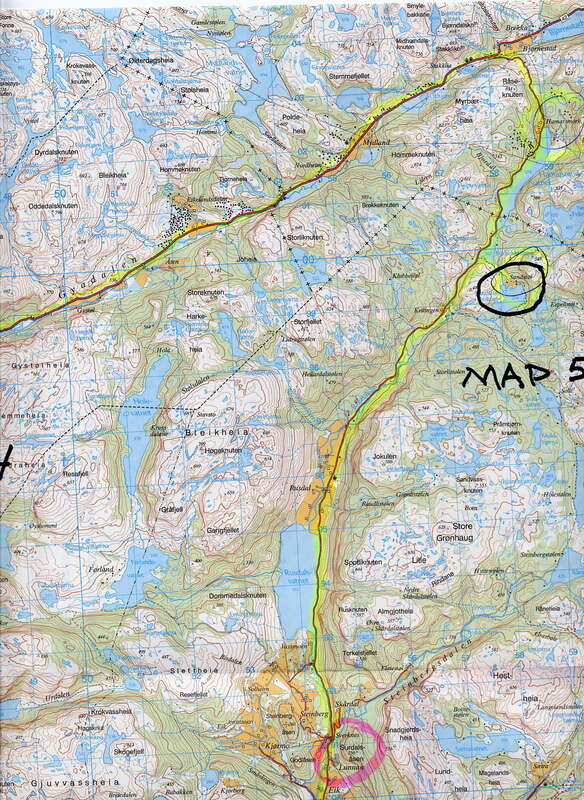 We made our base station in Kopervick on the Island of Karmøy located between Stavanger and Haugesund. This is where my father came from. 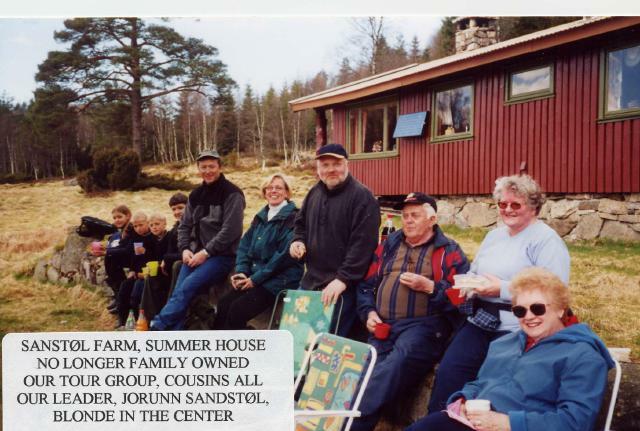 We stayed in local hotels and then when Leslie and Evelyn went home, we moved in with my first cousin once removed Helene and Kåre Vedø. They are what every genealogy seeker should have when looking for your ancestors. Helene knows all and Kåre is a great record searcher. 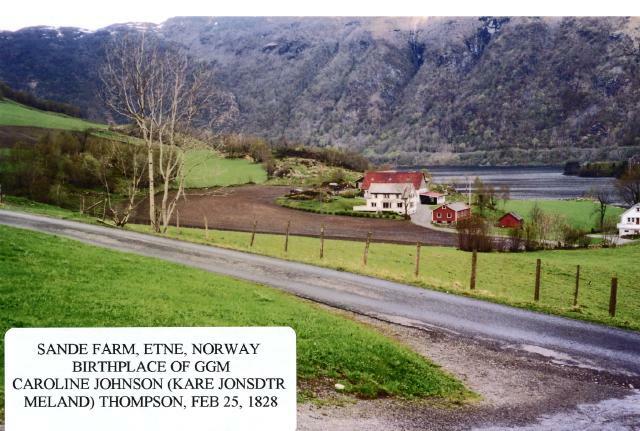 Prior to Leslie and Evelyn departing, we ventured out to the area east of Haugesund looking for Årek Farm, the birthplace of GGF Thomas Thompson and we also looked for Sande Farm, the birthplace of GGM Kare Johnson. We were close, but didn’t find either. 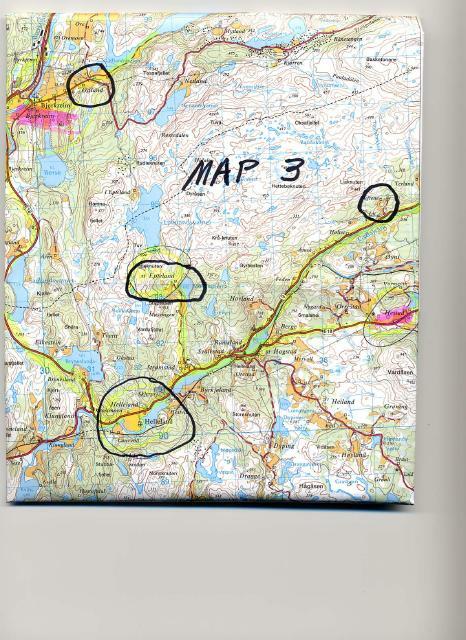 We then took a drive to southern Norway to the Moi and Flekkefjord area looking for where GM Lettie Sandstøl came from. As we had little to work with except some very old written data, we were not successful in either venture. I did not give up and before I left Norway I had many more maps and was determined to find what I was looking for. 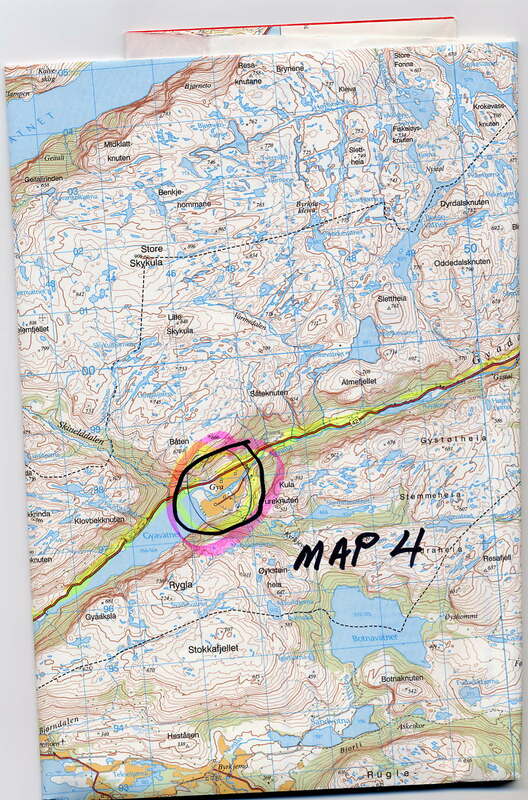 Our second trip to Norway was delayed by the 911 attack and was rescheduled to Apr-May of 2002... This was to be a 3-week trip for Kay and Les only. Prior to our departure many things had happened to make our planned search easier. 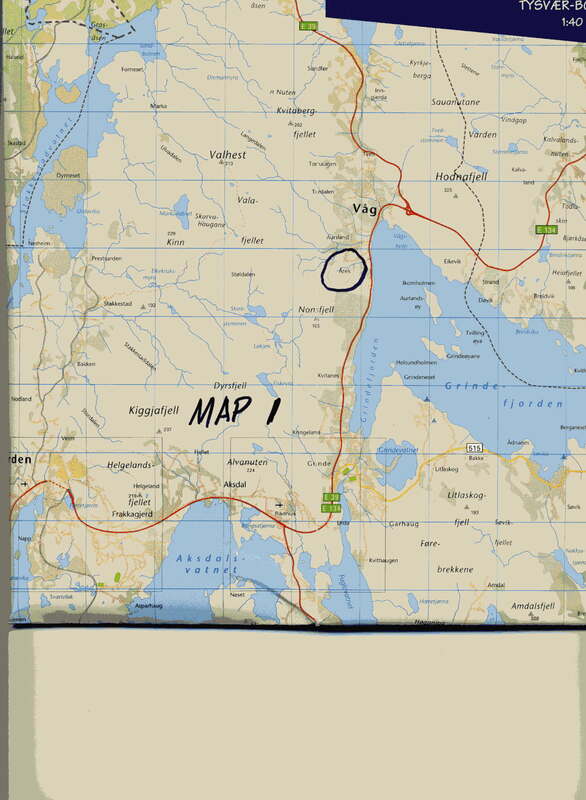 Helene and Kåre had located Årek Farm and Sande Farm and had driven to the area. My second cousin once removed Ruby Peters had stumbled into a contact on the Internet in Norway and came up with Hans Gangstø from Haugesund. He was very much into genealogy and provided copies of several pages out of the book written by Nils Olav Østrem. This book is 8 inches by 10 inches and 1 ½ inches thick and was of the Tysvær area. It is a typical book of the Norwegian Farms and their owners going back to the beginning of records. It is put together from church and government records. Nils Olav was currently in the process of finishing his Doctoral Degree in History of Norwegian Emigration to the United States. We became friends over the E-mail route and we met him, his wife and daughter on our trip to Norway. 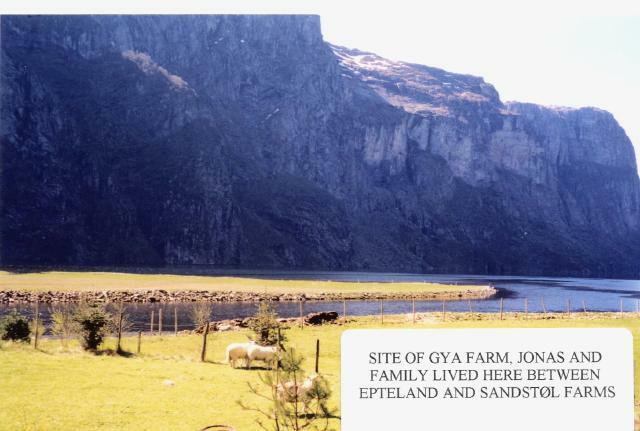 Årek Farm is located approximately 11 KM northeast (as the crow flies) of Haugesund along the north side of route E 134 and along the north side of Grinde Fjord. 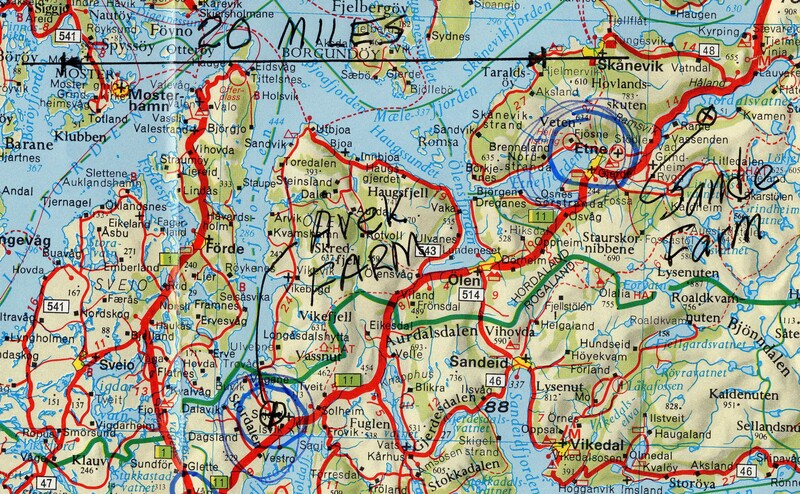 See Map 1, Årek Farm. The farm was on the hillside with a southern exposure. See the picture from the farm looking down over the Fjord. No one from the family currently lives on the farm and all the old buildings are gone except for some old rock foundations. Norway has lots of rock. Thomas A. 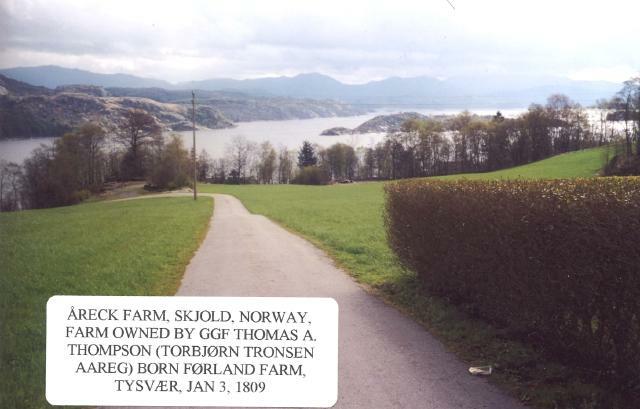 (Thorbjørn Torsen AAreg) Thompson was born in 1809, not 1812, as shown in family records, on Førland Farm, Tysvær. You will note that Norwegians love to change their names and how they are spelled. Årek currently is spelled as shown. Other spellings are AAreg and Åreg. My own name has changed from Veaae, to Veaa to Vea over 200 years. In 1837 Thomas sold his interest in the farm and left Stavanger, Norway on the sloop Enigheden. He traveled to New York City, up the Hudson River, westward on The Erie Canal and down the Great Lakes to Chicago. From Chicago they went by wagon to Norway IL. Norway is north of Peoria. Little else is know until Kare arrived in Norway, IL. This area is frequently referred to as the Fox River Area. Caroline (Kari Jonsdatter Mæland) Johnson was born on Sande Farm, Etne Paris on Feb 25, 1828. Sande farm is about 70 KM northeast of Haugesund. See Map 2, Sande and the picture of the farm. The farm sits on the south side of Slordalso (lake). Highway E 76 is on the north side of the lake. Her parents were Husmenn (renters) and did not own land. In 1843 Kari went to Skudenes (on the south end of Karmøy Island to work) to earn money to come to the US. This was a big herring processing area and there was lots of unskilled labor required. On May 11, 1847, Kari left from Bergen on the Kong Sverre and arrived in New York City on or about June 20. The ship's manifest also shows Halvor Johnson Sande. This was Kari’s brother. No further information is known of where Halvor went except at one time there was a Halvor Johnson working for Thomas. At this point we should look at the different last names. 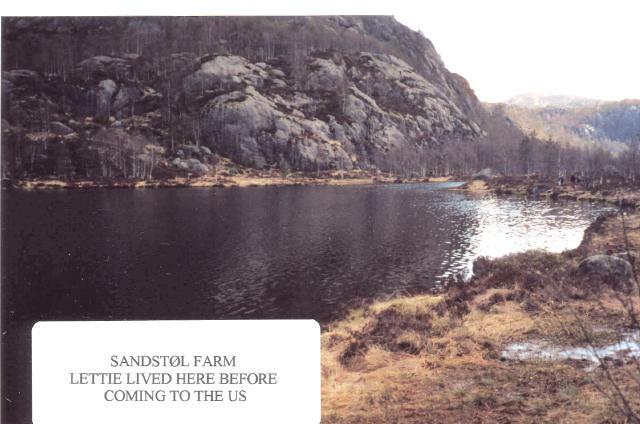 As it was the Norwegian custom to use the name of the farm as the surname, I would suspect that Kari’s father moved on to the Mæland farm prior to her departure to the US and Halvor had stayed at Sande Farm until he left. Note the two spellings of Kare and Kari. Kari continued on to Norway, IL and met and married Thomas on Apr 1, 1848. Almost all Norwegian ladies that came to the USA were married within one year of their arrival. The children, including my GF Andrew, were all born in Norway, IL and then about 1878, they moved on to Strand, IA. I had trouble getting deeply into the ancestors and descendants of my grandmother Lettie Sanstøl Thompson as the Norwegian connection was lacking. The American Sanstols drop the d. One day an E-mail arrived from Rick Kilmer who had developed a web site on my first cousin once removed, Pete Sanstol, the famous Norwegian boxer. Rick was Pete’s step grandson. Rick had heard from Jorunn Sandstøl Birkland who had come across the web site looking for Her Uncle Martin’s GGF in America. This was none other than my GGF, Jonas Pederson Odland Sandstøl who had emigrated from Norway to the USA in 1905 and died in 1911. He was buried in the Landa, ND Cemetery. Rick sent the E-mail on to me and the Norwegian connection was there. Jorunn, my half second cousin, is like my cousin Helene on the Vea side, she knows all about the family or where to find it. I connected Jorunn to Del and he came up with a picture of GGF gravestone in the Landa Cemetery. Most of the Norwegian ancestors’ data came from Jorunn. Like Del, I arranged to meet Jorunn on our visit. Jorunn picked us up in Sandnes in the morning and we started on our whirlwind tour of the ancestor sites in southern Norway. 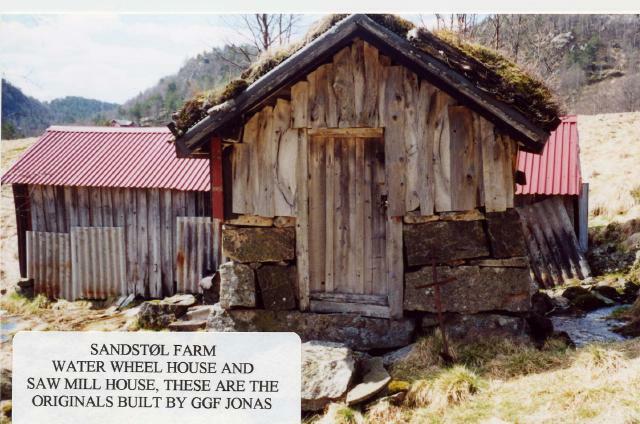 I will run the tour through the way that GGF Sandstøl lived it. 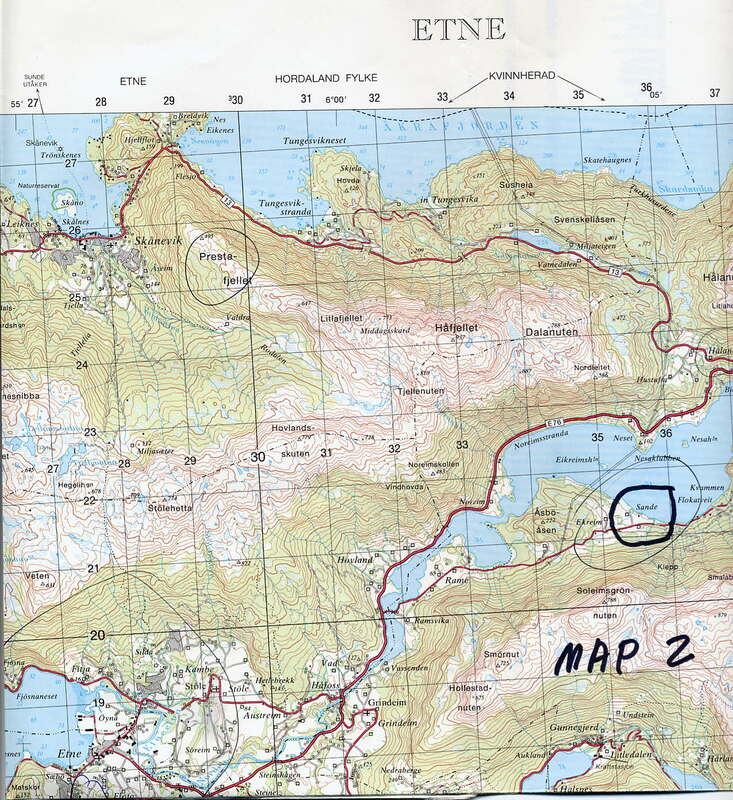 See Map 1 and the picture of the farm site Odland. 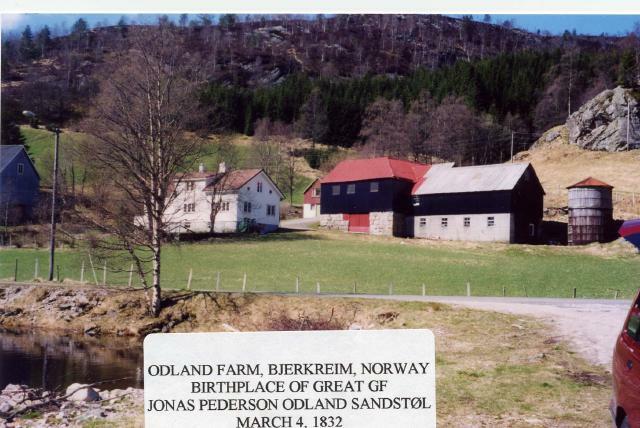 Jonas Pedersen Odland Sandstøl was born on Odland Farm, Bjerkreim on Mar 4, 1832. He married Lotte Nilsdtr Øen on Mar 15, 1853. To this marriage six children survived. The first-born was my Grandmother, Taletta Tobine (Lettie) Sanstøl. 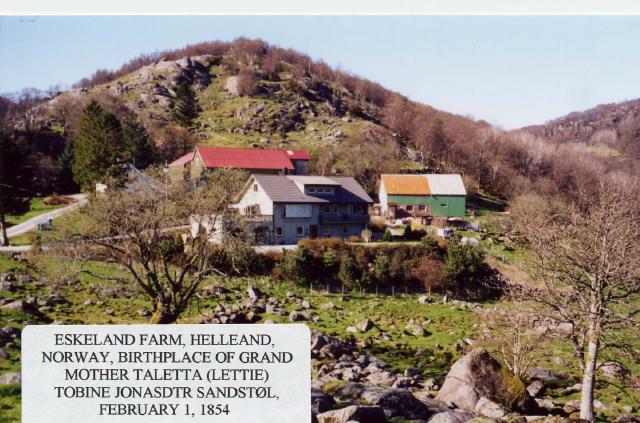 She was born on Feb 1, 1854 on Epteland Farm, Helleland. The second child Tunnis was also born there. 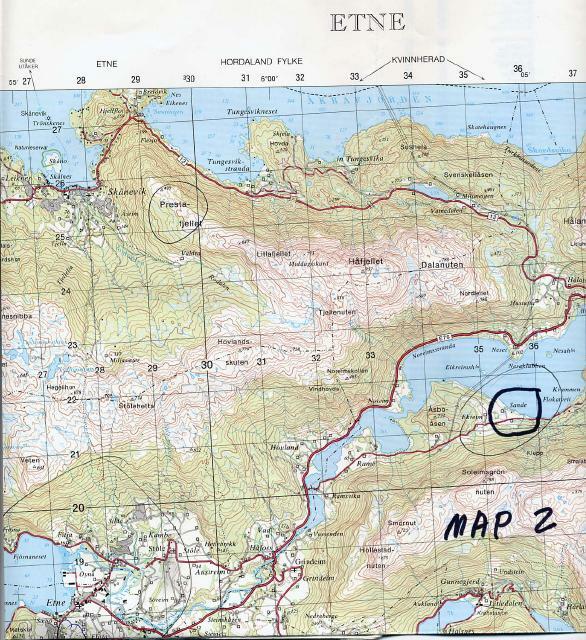 The remaining children were born at various places as Jonas and Lotte moved several times. Lotte died on Feb 12, 1867. By this time they were living at Gya Farm. In 1870 Jonas married Berte Serene Omundsdtr Gya and on Nov 24, 1870 Siri Lovise Jonasdtr Gya was born. Siri is the Grandmother of Jorunn. The family moved to Sandstøl Farm in 1875. Lettie, her sister Elsie and husband emigrated from Norway to the USA in 1880. At a stop on the road near the farm we were met by two more groups of cousins and they continued on to other farms that Jonas had lived at with the family. We did not see Tuftene but we went past it. We stopped at Gya and saw where the house had stood. It was a beautiful site at the upper end of a lake. We went on to Sandstøl. This farm had been abandoned about 1950 due to poor access. A summer cabin now occupies the site. It is no longer in the family. We had to walk in and view the beautiful site. It is well described in Del’s write-up. We had coffee and Norwegian goodies at the site and enjoyed the setting. The picture of the group at the site is best described as Cousins to the left, Jorunn (the blonde lady), cousins and my wife Kay on the end. After the visit to Sandstøl Farm we had a late lunch and a good visit with the cousins. We do hope to see all of them in Seattle soon.